All these fairly basic pieces seemed a lot more dramatic when all piled on together. Adding the wall in back helped add to the stripy, almost dizzying effect. We visited my favorite Mac artist Michelle. Her eye makeup looked so awesome I had to have her try it on me. Colors used: Tan pigment with Quarry on the outer and inner corners. I'm actually pretty proud of myself with this look because i've totally been able to redo it at home! Who knew! Michell is the best though! Super cute look! Loving your blazer! 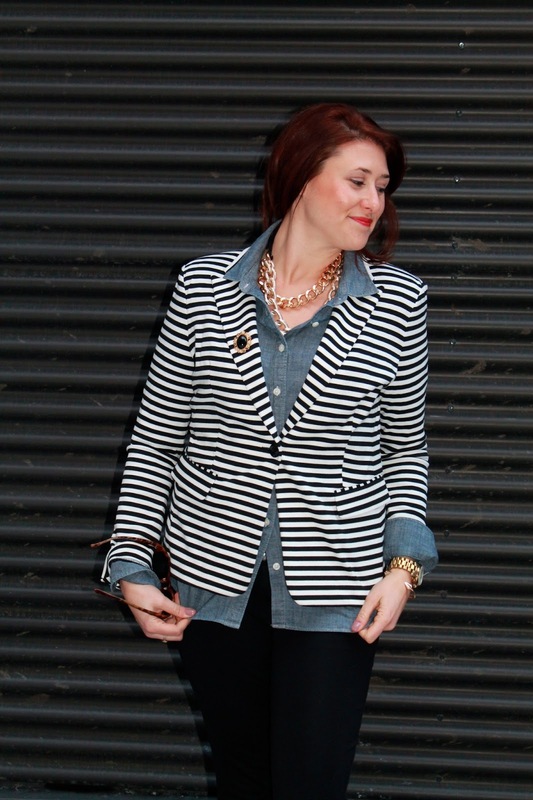 I am crazy for the striped blazer - it looks so sharp and you are right about having the striped background to just emphasize it even more!